The Telecommunications Competition Notice Guidelines (the Guidelines) document includes an overview of the competition notice regime as contained in Part XIB of the Competition and Consumer Act 2010 (Cth) (CCA). The Guidelines themselves set out the matters that the ACCC will consider when deciding whether to issue a competition notice and the appropriateness of the ACCC issuing competition notices as opposed to taking other action under the Act. 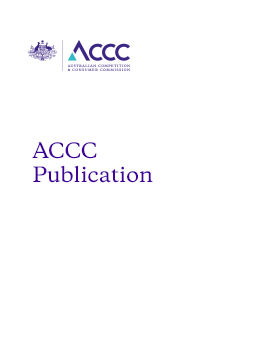 In August 2018, following public consultation, the ACCC updated the Guidelines in order to reflect the legislative changes that have been made to the competition notice regime since they were last updated in 2015.
administrative and clerical updates to ensure the Guidelines remain legally accurate. To view stakeholder submissions, visit the consultation at: Telecommunications Competition Notice Guidelines.